M.T. Anderson has written everything from picture books to young adult novels. Anderson received the National Book Award in 2006 and he’s written contemporary stories, historical ones, fantasy and science fiction novels including Feed, The Astonishing Life of Octavian Nothing, Traitor to the Nation, and the recent Symphony for the City of the Dead: Dmitri Shostakovich and the Siege of Leningrad. 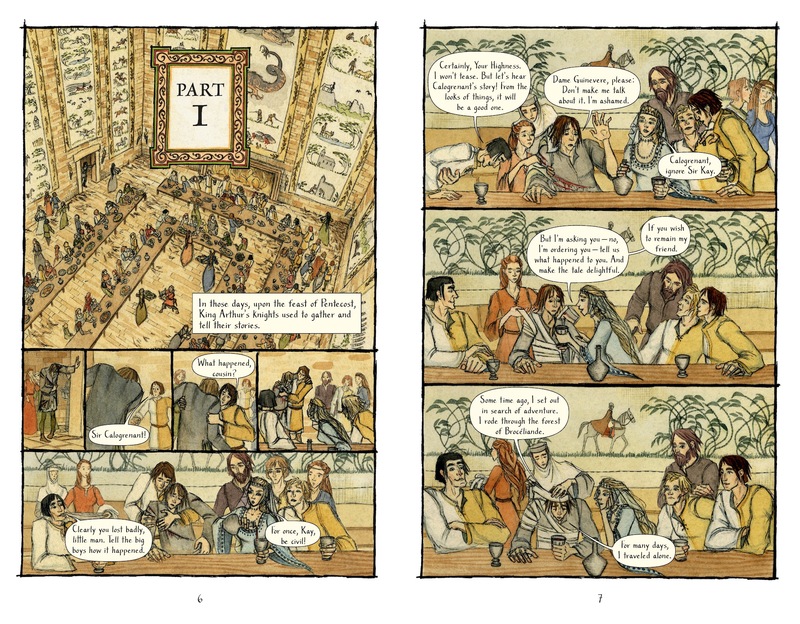 His first graphic novel, Yvain: The Knight of the Lion, illustrated by Andrea Offermann, is out now from Candlewick Press. The book is a retelling of a 12th Century epic poem by Chrétien de Troyes. Though not well known today, de Troyes is considered one of the greatest and most influential medieval writers. Anderson and Offermann made a number of striking and inspired artistic choices as far as how they approached and presented the story, which is both very much about the 12th-13th centuries, but also very contemporary in some ways. Are you a comics fan? Have you always been one? When I was a kid, I was a comics fan; as an adult, I’m a graphic novel fan – especially the French bandes dessinnée. When I was a kid, the European books like RanXerox and even England’s Judge Dredd struck me as a little too grim, frightening, and morally ambiguous. I was always more DC than Marvel (in the 80s sense of those worlds): I yearned for a sense of right and wrong, good and evil. As an adult, I like the French books not simply because of their moral intricacy and their odd storylines, but because of the gorgeous, stylized artwork of artists like Jacques Tardi, Regis Loisel, François Schuiten, and Serge Pellé. In the American scene, I’m a particular fan of high-concept graphic novels by people like Gene Yang and Chris Ware. What made you interested in writing a graphic novel and how did you settle on this story? As I say, I love graphic novels – and as a one-time Dungeons & Dragons player, I love medieval literature. And there are so many great, thrilling, bizarre stories from the Middle Ages locked away in epics and miracle books that people don’t read any more, so I thought – why not take this ancient story and make a version for a new audience? What is the story of Yvain, because I’m not sure how well known the story is. It’s not a well-known story any more! 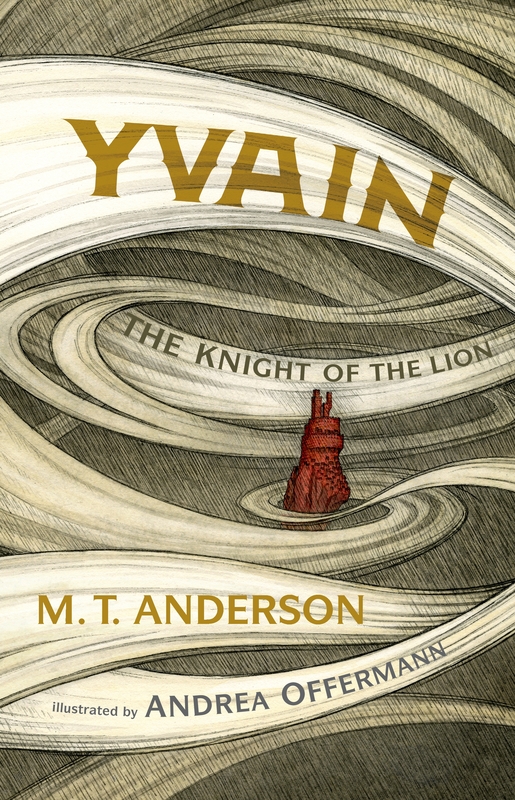 Yvain, a knight, kills a man during a face-off over a magical pool that controls the weather. The problem is, Yvain falls in love with the dead man’s wife. He decides he’s going to marry her, whatever her feelings might be. This is just the first bad decision of many. Things go downhill from there. The whole thing pits the world of medieval men (with their somewhat simplistic notions of adventure, fame, and knightly bromance) against the world of medieval women (who have to find ways to live and to exert power in this culture of masculine chivalry). The original epic is a rare glimpse into the anger and anguish of strong-willed women who realize that they have to deal somehow with the brittle male heroic ethos that’s all around them, however obtuse and short-sighted it might be. Could you talk a little about who Chretian de Troyes was because he’s not well known or read today, but he was this key figure in understanding the Arthurian legend. Yes – Chrétien de Troyes, the author of the original epic Yvain, was the first person in literary history to mention Camelot, the first person to write about Lancelot falling in love with Guinevere – one of the first people to codify all of our stories of King Arthur. In terms of Yvain, what I find interesting about Chrétien’s life is that when he wrote it, he was working for one of the most powerful women in France – Marie de Champagne, the daughter of the famous Eleanor of Aquitaine. Marie de Champagne’s court was kind of like a school for sharp young women. So it seems like Chrétien couldn’t write the kind of thing he usually did – a story for the men of the court – because now he had a different patron. Some of his earlier epics, like his Eric and Enid, have the usual medieval stuff in which women are either passive or get in big trouble by being active, but it’s almost like this epic, Yvain, is penance for those, suddenly exploring the female characters with subtlety. I find this interesting because the debate about the role of women in fantasy and in adventure still rages. It’s not dead, strangely enough. If anything, it has recently got more virulent. People know you for your novels, but you’ve written a few picture books as well and I’m curious how you wrote the book? I wrote my part of Yvain like a Hollywood script, though somewhat less detailed. I didn’t break it down into individual “shots,” for example. So much should be left up to the illustrator! They have their own vision. In this case, Andrea Offermann did an incredible job of bringing the story to life. For example, I would just write, “They fight,” and Andrea would have to choreograph this whole battle scene with giants or demons or wild animals. My job is really a lot easier than hers. For you, what was the most important aspect of the story that you wanted included in this graphic novel? Well, our vision is that we would reproduce some of Chrétien’s irony by having the Andrea’s illustrations extend slightly beyond what my text tells the reader. If I’m the male narrator, Andrea’s illustrations also give voice to the emotions of the women in the story. We wanted to encompass that tension right in the relationship between text and pictures. The book is interesting and it captures this gap I think between what contemporary pop culture tells us what heroic stories are like and what classical stories tells us. They’re moody and complicated and don’t have an unambiguously happy ending. Absolutely! So many of the most powerful ancient stories are deeply tragic, and that’s one of the reasons they’re so enduring. We tend to think nowadays that we have to inject “darkness” into the stories of the past, as if people with a life expectancy of 25 didn’t understand how hard their world could be. But in fact, look at the myths of the Greeks, for example – they’re nothing but cycles of tragic violence, and that’s part of their terrifying, powerful vision. The book opens and closes with falcons. Whose idea was that and where did the idea come from? It’s so cool you should ask that! Because that’s a great example of how the collaboration worked. I had described a more straightforward opening. As the narrator talks about how close love and hate are to each other, we see flowers in a woodland … and then see that blood has dripped on them … and then back up and see a wounded knight sagging on horseback, bleeding … and so on. Andrea went a different direction, opening the narration while we see someone releasing a falcon. At first, you don’t know who this is or why you’re seeing it. When you realize much later what this is, and why it’s there, it’s a much more subtle conception than mine would have been. 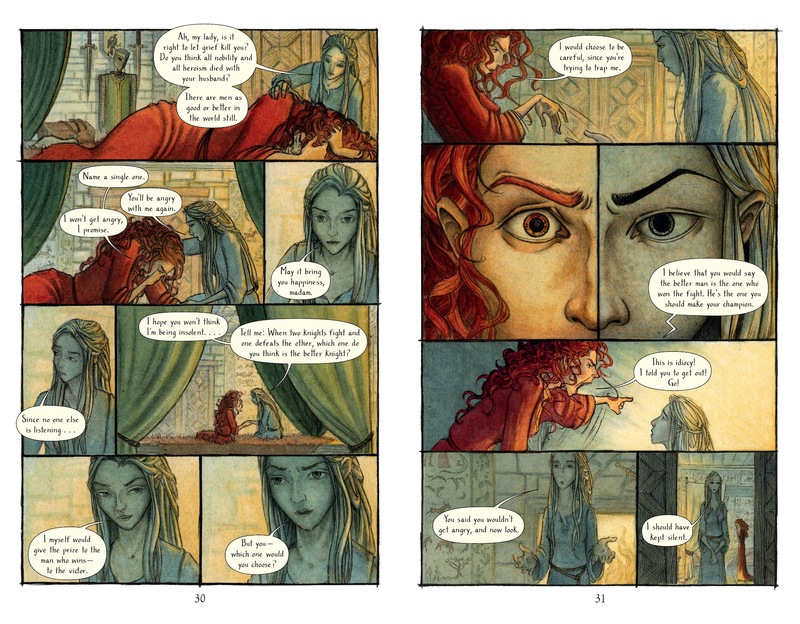 This is a really good example of how the tension between art and text should work – and I’m so grateful to Andrea for putting so much thought and hard work into this book! Usually after people’s first graphic novel, especially if they’re coming to the form from other fields, I ask, so did the experience make you want to make another? Or run far away and never do it again? I loved it! I actually will be working on a graphic novel adaptation of a Breton folktale about a mythical, demonic sunken city with First Second. I’m looking forward to it! I’ll tell you when something’s ready – maybe five years from now? YVAIN. Text copyright © 2017 by M.T. Anderson. Illustrations copyright © 2017 by Andrea Offermann Reproduced by permission of the publisher, Candlewick Press, Somerville, MA.